It has been a while since the last YAH ornament has been added here. I sincerely believed that Starbucks will be releasing one ornament every Friday. Unfortunately, this didn’t happen, and as an excuse, our beloved company has delivered two minis in one shot last weekend. You Are Here Ornament Austria is one of those. 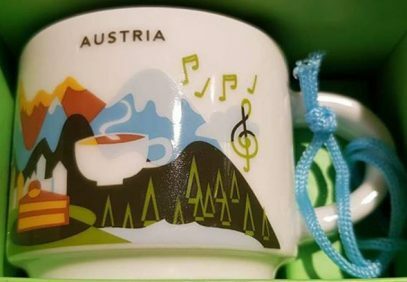 It comes with the blue string and has the same color inside, similar to the bigger mug, Austria YAH. As a reminder, there was also a limited edition ornament for this country.